In a Russell Finex demonstration video you can view a high fructose corn syrup sweetener powder being graded using the Finex Separator™. 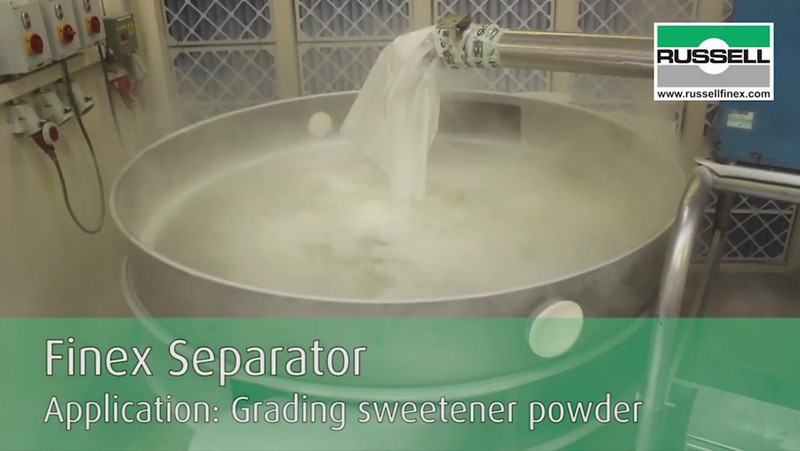 This industrial powder grading sieve provides the perfect solution for separating sweetener powder. Two fractions of product are separated in one continuous operation, then packaged for use in various food and beverage applications, depending on the desired cut. This type of grading separation for food ingredients can also be used for removing oversize contamination, dewatering wet material, and de-dusting. Established in 1934, Russell Finex has developed a wide range of vibratory separators, check-screeners and self-cleaning inline filters for many different processes within the food and beverage industry. With a customer base including Nestlé, Mondelēz, Unilever and Mars, the company understands the needs of the EC Official Controls of Foodstuffs Directive and the UK Food Safety Act and GMP, as well as FDA and USDA requirements. To discuss your food and beverage processing requirements, contact Russell Finex today.